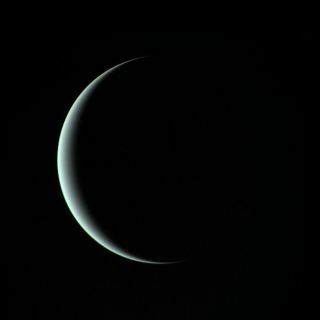 This image of a crescent Uranus, taken by NASA's Voyager 2 spacecraft on Jan. 24, 1986, reveals the planet's icy blue atmosphere. Despite Voyager 2's close flyby, the composition of the atmosphere remained a mystery until now. There's a lot of really smelly stuff wafting around Uranus. The clouds in Uranus' upper atmosphere are composed largely of hydrogen sulfide, the molecule that makes rotten eggs so stinky, a new study suggests. "If an unfortunate human were ever to descend through Uranus' clouds, they would be met with very unpleasant and odiferous conditions," study lead author Patrick Irwin, of Oxford University in England, said in a statement. But that wayward pioneer would have bigger problems, he added: "Suffocation and exposure in the negative 200 degrees Celsius [minus 328 degrees Fahrenheit] atmosphere, made of mostly hydrogen, helium, and methane, would take its toll long before the smell." Irwin and his colleagues studied Uranus' air using the Near-Infrared Integral Field Spectrometer (NIFS), an instrument on the 26-foot (8 meters) Gemini North telescope in Hawaii. NIFS scrutinized sunlight reflected from the atmosphere just above Uranus' cloud tops — and spotted the signature of hydrogen sulfide. "Only a tiny amount remains above the clouds as a saturated vapor," study co-author Leigh Fletcher, from the University of Leicester in England, said in the same statement. "And this is why it is so challenging to capture the signatures of ammonia and hydrogen sulfide above cloud decks of Uranus. The superior capabilities of Gemini finally gave us that lucky break." These infrared images of Uranus' two hemispheres were taken with the Keck telescope in July 2004. The planet's north pole points down and to the right. Neptune's clouds are likely similar to those of Uranus, the researchers said. The big difference between the clouds of these two "ice giants" and those of Jupiter and Saturn probably trace to the worlds' formation environments: Uranus and Neptune coalesced much farther from the sun than the two gas giants did. "During our solar system’s formation, the balance between nitrogen and sulfur — and hence ammonia and Uranus's newly detected hydrogen sulfide — was determined by the temperature and location of [a] planet’s formation," Fletcher said. The new study was published online today (April 23) in the journal Nature Astronomy.